LAS VEGAS and ATLANTA, Dec. 12, 2017 /PRNewswire/ -- Scientific Games Corporation (NASDAQ: SGMS) ("Scientific Games" or the "Company") today announced that its $5 DC-7s game created for the DC Lottery has won the Buddy Roogow Innovation Award for "Best New Instant Game" in the 2017 North American State and Provincial Lotteries Association (NASPL) Awards held at the NASPL 2017 Annual Conference in Portland, Oregon. The DC Lottery directly benefits the residents and economic vitality of the District of Columbia. In addition, the $100 Ultime game designed by Loto-Québec and Scientific Games was one of the two finalists for "Best New Instant Game" of 2017. In total, nine of the 13 games nominated by U.S. and Canadian lotteries for "Best New Instant Game" were designed and manufactured by Scientific Games. Included in the nine nominations was a "family" of four games, with Scientific Games creating and producing the $5 and $10 game in the suite. Another finalist for "Best New Instant Game" was created by British Columbia Lottery Corporation featuring the CIRQUE DU SOLEIL KOOZA™ brand from Scientific Games' global portfolio of licensed properties for lottery and casino games. Named in honor of the DC Lottery's former executive director, the Buddy Roogow Innovation Award won by the $5 DC-7s game celebrates "the efforts made to create and communicate the innovative attributes of new instant and draw style games." "Our mission is to provide games that players enjoy and generate revenue for the District. It's great when a game we offer not only accomplishes those goals, but also is also honored by our peers in the industry," said Tracey Cohen, Interim Director for DC Lottery. 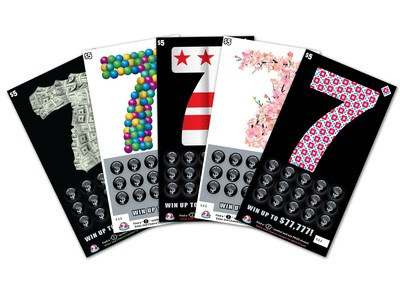 The DC Lottery's best-performing $5 game this year, DC-7s features 21 different scenes showcasing players' favorite number "7". Colorful DC-themed designs include the District of Columbia flag, cherry blossoms and U.S. currency—all in the shape of "7." The game offered instant win opportunities for more than $1,000,000 in total cash prizes, including two top prizes of $50,000. "On behalf of Scientific Games, we congratulate the DC Lottery and both finalists for 'Best New Instant Game' of 2017 in North America," said John Schulz, Senior Vice President Instant Products for Scientific Games. "We have established a very high bar for instant product innovation, and we appreciate that so many of our games were nominated. We look forward to continued collaboration with our customers to create games that help drive maximum revenues for their beneficiaries." In 1974, Scientific Games developed the world's first secure lottery instant game and is the world's largest provider of instant games. Today, the Company provides games, technology, and services to more than 150 lotteries globally, including nearly every North American lottery. Cirque du Soleil and KOOZA are trademarks owned by Cirque du Soleil and used under license. © 2007 Cirque du Soleil. All rights reserved. Licensed by Cirque du Soleil. © 2017 Scientific Games Corporation. All Rights Reserved.